If there's one iconic, brilliant graphic novel that I'd recommend, it's the series Strangers In Paradise by Terry Moore. Following Katchoo, her best friend/love of her life Francine, and their friend/beloved David as they grow up and get over their various issues (from self-image to the mob!) together. While she's a central character in the entire DC Comics Gotham Central series (a cop drama focussing on Gotham's police department... the most non-corrupt part), the second story of the series, Half a Life, is an awrd-winning graphic novel around Renee Montoya's coming out. The 52 series published a comic for every week of the year, in a long running and complicated story following the activities of various characters. In week Eleven, The Question (Renee Montoya) is back in Gotham and keeps running into both her ex-girlfriend, Kate Kane (Batwoman). Turns out there's a mysterious prophecy involving Kate's death at the hands of a cult (a storyline wrapped up in Batwoman: Elegy). If you're interested in Gotham Central, but want something a bit more superhero-ish, then the cape swooping rooftop swinging, drama filled, lesbian Batwoman is for you! Detective Comics 854-860, now published as a proper graphic novel in Batwoman: Elegy is an extremely good start on a mainstream lesbian hero. A young adult graphic novel about a girl at high school, suicide, first love, and figuring out who you are. Skim won a very long list of awards and mentions. This comic by Colleen Coover and Paul Toibin follows the story Annah. Possibly crazy, certainly a little mad, she juggles boyfriend and girlfriend, and bounces around life in a desperate search for her missing sister, Ginger - who is apparently created from her brain and is the part the does all of the feeling for them both. If you're looking for recommended graphic novels (on any subject) check out Good Graphic Novel Reviews. 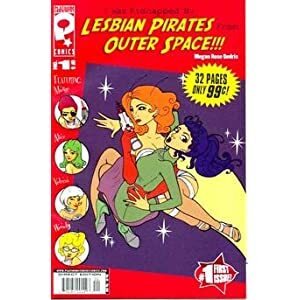 Many published lesbian graphic novels were (and are) webcomics. If you want to read them for free online, check out the list of lesbian webcomics. Webcomics online are listed here and classified as 'Free Stuff'.